UN, November 19. /TASS/. 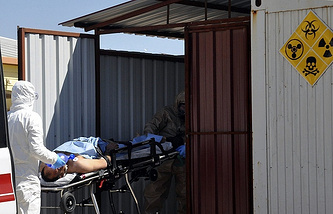 Sweden and Uruguay, two non-permanent members of the United Nations Security Council have submitted a draft resolution on resuming the work of international investigators into chemical attacks in Syria, a Russian diplomat said on Saturday. "Sweden and Uruguay have submitted to the UN Security Council another ‘compromise’ draft on resuming the work of JIM [Joint Investigative Mechanism]," said Fyodor Strzhizhovsky, the press secretary of Russia’s Permanent Mission to the UN. An unnamed UN source told TASS that the vote on the document may take place on November 19. The mandate of the Joint Investigative Mechanism (JIM) of the United Nations and the Organization for the Prohibition of Chemical Weapons expired at 08:00 Moscow time on Saturday after four unsuccessful attempts by the UN Security Council to extend it. On November 18, Russia vetoed the Japan-initiated draft to provisionally extend the mission’s mandate by 30 days. On Thursday, Moscow vetoed another text, drafted by the US, which suggested to extend the mandate of the mission in its present form. Later on that day, a similar document by Moscow failed to get required support among the council’s members. Russia’s UN envoy, Vasily Nebenzya, said on Friday that the mission’s mandate can be extended "only on the condition that fundamental flaws in its work are fixed." He added that the mission "has covered itself with shame" by "putting their signatures under groundless charges against Damascus. ".